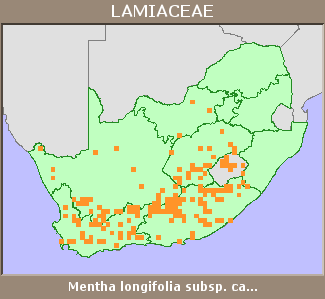 Mentha longifolia (L.) Huds. subsp. capensis (Thunb.) Briq. Mentha capensis Thunb., Mentha longifolia (L.) Huds. subsp. bouvieri (Briq.) Briq., Mentha longifolia (L.) Huds. subsp. capensis (Thunb.) Briq. var. cooperi Briq. ex T.Cooke, Mentha longifolia (L.) Huds. subsp. capensis (Thunb.) Briq. var. 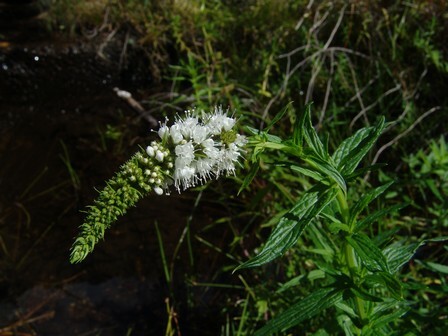 doratophylla Briq., Mentha longifolia (L.) Huds. subsp. capensis (Thunb.) Briq. var. obscuriceps Briq., Mentha longifolia (L.) Huds. subsp. capensis (Thunb.) Briq. var. salicina (Burch. ex Benth.) Briq.